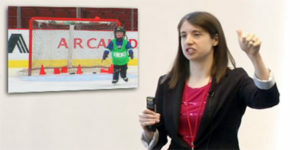 Dr. Krista Johnston has had a long standing interest in the modification of CBT for children with ASD. 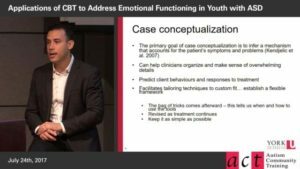 In this 20 minute presentation, Dr. Johnson highlights the growing evidence that group cognitive behavioral therapy (CBT) treatments to address mental health issues, such as anxiety, are promising alternatives to standard individual CBT treatments for children with ASD. However, despite high demand, group treatments are often not available in the community – greater progress is needed to translate knowledge from academic/healthcare research settings to everyday practice in the community. The Facing Your Fears program is a manualized and evidence-based (Reaven et al., 2011), modified CBT group treatment for children with ASD and anxiety disorders. Clinician-researchers at BC Children’s Hospital have administered 15 of these groups to children between the ages of 8 and 13 and their parents over the last five years. A selection of research findings will be shared. The presentation will include information to support parents in recognizing anxiety and seeking appropriate services as well as information for professionals interested in learning more about clinical and research efforts related to increasing community accessibility of group treatments targeting mental health concerns. 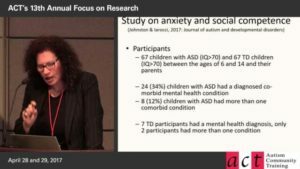 Cite research on a group treatment program for treating anxiety in ASD. Translate clinical research in a tertiary-care setting to community-level implementation. 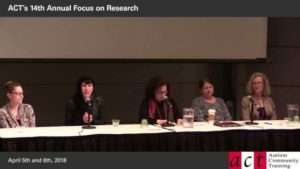 Discuss clinical and research challenges associated with offering group treatments for children with comorbid mental health issues in community settings. 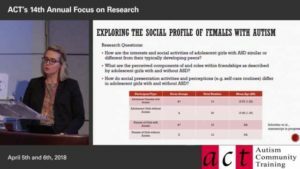 Krista Johnston, PhD, graduated in Clinical Psychology specializing in Autism and Developmental Disorders with special interest in mental health in ASD. She has worked with individuals with ASD and their families for 16 years and is currently completing her residency at BC Children’s Hospital.